What can you clean with CLR? If you have a specific surface that you would like to know can be cleaned with CLR, search the material on our Frequently Asked Questions to find the answer. If it is not there – contact us. When you say diluted, how much water to CLR do I use? Use equal parts CLR to water, i.e. 1 cup CLR mixed with 1 cup water. Yes, CLR is septic safe. How do I use on a stain in my toilet? Wear household gloves. Mix equal parts CLR and warm water. Apply directly to stain with a brush, cloth or sponge. Rinse promptly with cold water. If the stain does not disappear use CLR full strength, wipe and rinse properly. Where do I buy CLR? 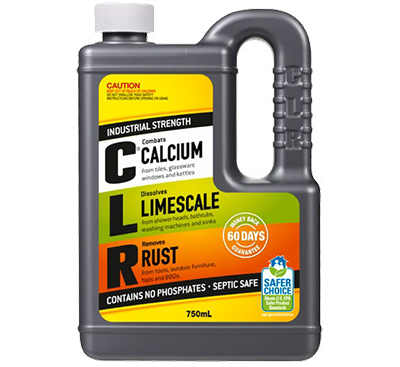 You can buy CLR at Bunnings, Coles, Woolworths, Metcash, SPAR (QLD ONLY), Mitre10, Home Timber Hardware and Blackwood’s. For a full list of stockists click here. How long should I leave CLR on the stain for? We recommend you do not leave on the stain for longer than a few minutes. Do not leave CLR on the stain and walk away from it. Always rinse thoroughly. Can I use CLR on my car (radiator, window etc)? No. It is not recommended for use on cars as it may damage paintwork and/or interiors. Can I use on my chlorinated swimming pool tiles? What is the main ingredient in CLR? 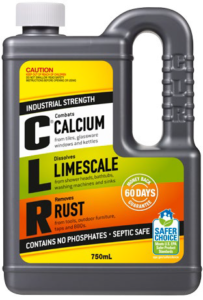 Calcium Lime Rust, more commonly known as CLR, is a household cleaning product used for dissolving stains, such as calcium, lime, and iron oxide deposits. Its ingredients include water, lactic acid, gluconic acid, lauramine oxide, Propylene Glycol, n-Butyl Ether, and solvents that dissolve cobalt gel coats and paint. How do I use CLR? In a well-ventilated area , mix equal amounts of CLR and warm water. Test on a hidden area before applying to the entire surface. Apply directly to the stain with a brush, cloth or sponge. After 2 minutes rinse promptly with cold water. Never leave CLR on an area for longer than two minutes. If the stain does not disappear, repeat this process and add more CLR solution as necessary. Never mix CLR with other household cleaners or bleach. How do I use CLR to clean my coffee maker? Mix one part (ex: 1 cup) CLR to eight parts (ex: 8 cups) water (for 10-12 cup automatic drip coffee makers). Run through coffee maker as if making coffee. Dispose of solution once product has run completely through the maker, then fill entire pot with clear, cold water and run a complete cycle twice. Instructions are for a regular 8-12 cup coffee maker. *Do not use CLR in coffee makers that hold water permanently. *CLR is not recommended for Gevalia, Keurig or Cuisinart coffee makers. *Do not use CLR in espresso machines. How do I use CLR to clean coffee pots, pans or tea kettles? Pour enough CLR to cover the bottom. Swish around in the pot or pan. Add one cup of warm water, allow mixture to soak for two minutes and thoroughly rinse with cold, clean water. Using a soft scouring pad while our product is sitting on the stains is recommended. Always check with the manufacturer of your coffee pots, pans and tea kettles first for their recommendations of products that are safe and effective on their materials. How do I use CLR to clean my dishwasher? Remove dishwashing rinse agent before using CLR. Pour a 1/2 cup of CLR into directly into the bottom of an empty dishwasher (no glasses, dishes, or flatware but the racks can stay). Run a normal cycle followed by an extra rinse cycle. Make sure there are no detergents or any other chemicals in the machine while using our product. For more detailed instructions read here. How do I use CLR to clean my washing machine? Run your empty machine (no clothes) without detergent up to the main wash cycle, which is where the water stops and the cycle is about to agitate. Stop the machine and add one-half cup of CLR directly into the tub of the machine. Finish cycle. Run one additional full cycle (wash and rinse) with water only to rinse machine fully. If your machine is HE (high efficiency) and/or ‘Water Saver’ we recommend using a 1/4 cup of CLR, instead of the normal 1/2 cup recommended for any other type of washer/dishwasher. For Front Loading Machines: Simply add a 1/2 cup of CLR to the soap dispenser (only 1/4 of a cup for HE machines). After the full cycle has completed, run an additional rinse cycle with just water. Make sure there are no clothes or other chemicals in the machine when using our product. Can I clean the filter to my humidifier? Use only on metal filters. Dilute equal parts of CLR and warm water into a plastic container. Dip the filter into the solution for about two minutes. Brush to loosen buildup and rinse with cold, clean water. Allow to dry. Can I put CLR in a spray bottle? We do not recommend putting CLR in a spray bottle. CLR is acidic in nature and the solution could “spray back” on your clothes or in your eyes or can get on materials it’s not intended to be used on. How do I use CLR to clean a showerhead? When you take a shower does it feel as if the water stream is not as strong as it once was? It’s not your water pressure. It’s time for you to clean your showerhead. Over time minerals in the water build-up in the pores of your showerhead and either clog the pore completely or limit the stream of water. Check out how to clean your showerhead in three easy steps. We recommend using a 50/50 solution (equal parts) of CLR and warm water. If possible, remove the showerhead and submerge it in the solution for no longer than 2 minutes (using an old toothbrush on the face of the showerhead after it has soaked will assist in removing the mineral buildup) then rinse promptly and thoroughly with cold water. Repeat at full strength if necessary, rinsing thoroughly after each application. How do I clean hard water deposits from my drinking glasses? We recommend using a 50/50 solution (equal parts of CLR and warm water) into a glass or porcelain bowl. Apply solution to the affected stained areas of the glasses using a damp cloth or sponge. After 2 minutes, rinse thoroughly with cold, clean water. If it seems that CLR helped a bit but the glasses are not completely clear, repeat at full strength if necessary. Due to the natural density and hardness of calcium as a mineral, the calcium can actually etch and embed itself into the material of the glass (usually present by having a cloudy appearance vs. spotty). I used CLR to clean my glasses and it did not remove the deposits. Do you know why? If it seems that the CLR did not help at all, the glasses may be etched and there is no remedy to remove the cloudiness. The cloudiness is actually tiny cuts made in the glass by deposits in the water. The only thing that may remove the etching is a jeweler’s polishing. Can CLR be used in a steam iron, steamer or steam machine? It is not recommended that CLR be used in steam irons. The acids in our products are not compatible with the components of steam irons, steamers or steam machines. We recommend contacting the manufacturer of your particular steam iron, steamer or steam machine for their recommendation for products safe and effective on their materials. Can I use CLR on my car to remove rust? We do not recommended using CLR on a car. The acids in our product should not be used on aluminum or any painted/coated surface. You can safely remove rust from car wheels (if rims are made of chrome or stainless steel only, no alloys). Can I use CLR to clean out my radiator? CLR should not be used in or on a car radiator. CLR may not be compatible with the materials associated with a radiator and it could have adverse effects if the CLR is not rinsed out completely. Is CLR safe for ice makers? We do not recommend using CLR to clean ice makers. The acids in our product are not compatible with the components of ice makers. We always recommend referring to the manufactures recommendation for safe and effective products to use on their materials. Will CLR remove oil from my concrete driveway or garage floor? We do not recommend using our CLR to remove oil. If CLR is mixed with oil, it will darken the concrete, which is very difficult to remove. To remove oil from concrete or blacktop, we do recommend using our product CLR Oil & Grease Remover. Yes, CLR is septic safe. By the time it reaches the septic system it is neutralized with water. Can I use CLR in my swimming pool? We do not recommend using CLR on or in any materials associated with a swimming pool. CLR should never come into contact with chlorine (or any other household chemical). It can create a poisonous gas and is not safe. We recommend consulting with a pool maintenance expert for recommendations for products that would be safe and effective. Can CLR be used on pool tiles? Unfortunately, we do not recommend using CLR on pool tile. It could remove the finish from the tile. In addition, if CLR comes in contact with chlorine, it could result in toxic fumes. We recommend consulting with a pool maintenance expert for their recommendation for products that are safe and effective. Can CLR be used on marble or synthetic marble? We do not recommend using CLR on any natural stones, especially marble (even synthetic). The acids in our product will remove the seal, penetrating the marble and can compromise the natural beauty of marble. Even synthetic marbles are coated and real marble dust is used to give the effect of real marble. If you spill CLR accidentally on these surfaces, make sure to call a marble professional for further instructions. Can CLR be used on galvanized metal? We do not recommend using CLR on galvanized metals. When a metal is galvanized, a Zinc coating is put over the metal (usually to protect it from rusting). The acids in CLR will remove the Zinc which could compromise the material. Can I clean cast iron with CLR? We do not recommend using CLR on cast iron. The acids in CLR can compromise the metal. How long is the shelf life of CLR? We recommend using or disposing of CLR within 3 years. Make sure cap is securely fastened after each use. Is CLR safe on grass, shrubs, plants, and flowerbeds? CLR is safe on grass, shrubs, bushes, plants, flowerbeds and all types of flora. We strongly recommend you water the area where the CLR will run down, land, or touch before and after using CLR. Can I use CLR on my granite countertop? We do not recommend using CLR on any natural stones, including granite. The chemicals in the CLR can remove the seal and penetrate the stone. Can I use CLR in/on my water heater? Jelmar DOES NOT RECOMMEND the use of CLR in or on any water heaters (tank or tankless); however there is a website that does. Again, JELMAR DOES NOT RECOMMEND THE USE OF CLR IN A WATER HEATER. The chemical make-up of CLR is not compatible with the materials or components of a water heater and cannot be thoroughly flushed through the water heater after 2 minutes. We recommend using what the manufacturer of the water heater deems safe and effective. Can I clean my vinyl siding with CLR? Yes. You can use CLR on vinyl siding as long as it is diluted and is thoroughly rinsed off of the surface in under two minutes. Studies have shown that the top coating of the siding will be affected if full strength CLR is left on the surface for five minutes or longer. Can I clean my fiberglass boat, tub, or shower stall? Yes, CLR is found to be safe on fiberglass. Always spot test first in an inconspicuous area. Begin with a mixture of CLR and water and progress to full strength if needed. Can CLR be used on clothes or fabric? No, CLR should never be used on clothing. Please find an appropriate stain remover or laundry detergent. If CLR is spilled on fabric, you must rinse immediately. It may break down the fibers in clothing and/or fabric. Can CLR be used on paver stones? Depending on the material of the paver (concrete is safe)it can safely be used. Always spot test in an inconspicuous area first. Make sure the pavers are not coloured, stamped, sealed or coated. Can CLR be used to clean stains from rugs? CLR should not be used to clean rugs or carpeting. CLR can break down the fibers in rugs and carpeting and pull the color out. Can I use CLR Calcium, Lime and Rust to clean my pet bowls? Yes, CLR is great for cleaning pet bowls from food, grime and water deposits! Dilute equal parts warm water and CLR to clean ceramic, stainless steel or plastic bowls. Leave on for 2 minutes using a sponge or scouring pad to assist in removal of stains, then rinse thoroughly with cold water. While our product is non-toxic we recommend washing the bowls prior to putting food or water back in them. Can I use CLR on concrete? While CLR is generally safe and effective in removing calcium, lime and/or rust from concrete, ALWAYS spot test in an inconspicuous area first. Apply a small amount of CLR to the spot test area using a damp cloth or sponge, let sit for no longer then 2 minutes, then rinse promptly and thoroughly with clear cold water. Let dry completely (usually overnight). If there are no adverse reactions between CLR and the concrete (change in color or texture), it would be safe to use on the other affected areas of the concrete. Do not use CLR on colored/tinted concrete, concrete poured less than 1 year ago, concrete that is stamped, sealed or coated. Note: Concrete is naturally made of calcium and run the risk of pulling the pigment out of concrete when using a calcium remover on something naturally made of calcium (such as CLR). 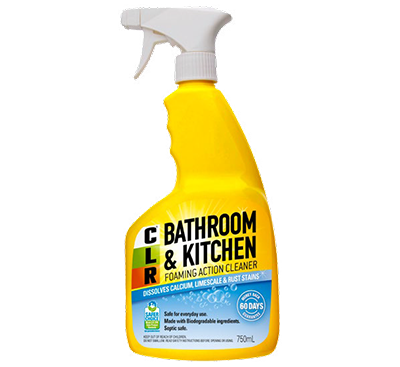 Is there a difference between CLR in the gray bottle and CLR Bathroom & Kitchen in the yellow spray bottle? Although they both come from the fine CLR family, they are formulated differently and solve different cleaning problems. See each product label for recommended uses along with the helpful information provided throughout our web site. How do I use CLR Bathroom & Kitchen? Always use CLR Bathroom & Kitchen in a well ventilated area while wearing household rubber gloves and test a hidden area of the surface before beginning to clean. When cleaning, apply the solution to a clean damp cloth, sponge, brush or directly to the surface to be cleaned, allow the foam time to work and then rinse with clean, cold water. Never leave the solution on a surface for more than two or three minutes. If the stain persists, repeat the process. Do not use CLR Bathroom & Kitchen with other cleaners or bleach. Never reuse the bottle when it is empty. Can I use CLR Bathroom & Kitchen on my faucets/taps? The CLR Bathroom & Kitchen can be used on faucets/taps made of chrome or stainless steel and should not be used on any other finishes including, but not limited to bronze, oil rubbed bronze, nickel, brushed nickel, brass or copper. Can CLR Bathroom & Kitchen be used on colored grout? No. It is only safe to use on white grout. If used on colored grout it will lighten the grout color over time or discolor. Can CLR Bathroom & Kitchen be used on marble or synthetic marble? No. The active ingredients in CLR Bathroom & Kitchen will have a reaction with the marble. Can I use CLR Bathroom & Kitchen in the washing machine or dishwasher to get rid of rust and lime deposits? No, CLR Bathroom & Kitchen should not be used in the washing machine or dishwasher. The detergents in the product may foam excessively when agitated. Use CLR in the gray bottle for these applications. The CLR Bathroom & Kitchen does not contain the ingredient necessary to remove rust, only our CLR in the gray container does. Can I mix CLR & CLR Bathroom & Kitchen? No. The two products have different ingredients and, as is true with any cleaner, should never be mixed with another cleaner. Can I clean my vinyl siding with CLR Bathroom & Kitchen? Yes. You can use CLR Bathroom & Kitchen on vinyl siding as long as it is diluted and is thoroughly rinsed off of the surface in under two minutes. Studies have shown that the top coating of the siding will be affected if full strength CLR Bathroom & Kitchen is left on the surface for five minutes or longer. Can I use CLR Bathroom & Kitchen on my one-piece shower enclosure? Only if the shower enclosure does not have a synthetic coating on it. Be sure to test a small, hidden area before cleaning the entire shower and wipe dry to check for any adverse effects. Is CLR Bathroom & Kitchen safe on acrylic? Yes, CLR Bathroom & Kitchen is perfectly safe for acrylic. Follow the directions on the bottle and be sure to rinse after 2-3 minutes. What other surfaces should I not use CLR Bathroom & Kitchen on when cleaning? Do not use on stone, mirrors, plastic laminates, wood, fabrics, painted surfaces or wall coverings. Can I use CLR Bathroom & Kitchen to clean my pet bowls? Yes, CLR is great for cleaning pet bowls from food grime and water deposits! Spray CLR Bathroom & Kitchen to affected area of ceramic, stainless steel or plastic bowl. Leave on for 2 minutes using a sponge or scouring pad to assist in removal of stains, then rinse thoroughly with cold water. While our product is non-toxic we recommend washing the bowls prior to putting food or water back in them. Can I use CLR Bathroom & Kitchen on granite? Our CLR Bathroom & Kitchen can safely be used on granite to remove hard water deposits and stains. Granite is the ONLY natural stone that our CLR Bathroom & Kitchen can be used on. Can I clean my glass shower doors with CLR Bathroom & Kitchen? Yes. Our CLR Bathroom & Kitchen is safe and effective on the glass only (avoid any contact with the frame, trim or track of the door, as these are usually made of aluminum)part of a shower door. The best way to apply it to the glass is to spray some CLR Bathroom & Kitchen into a damp cloth or sponge and apply it to the affected stained areas of the glass. After 2 minutes, take a clean sponge/cloth and clear cold water to remove the solution. Do not spray the doors as you will get the product on materials it’s not intended to be used on. How long can I leave CLR Oil & Grease Remover on a stain before rinsing? CLR Oil & Grease Remover should only be left on a surface 1-5 minutes then rinsed off with cool clean water. If the stain persists, repeat the process. How do I use CLR Oil & Grease Remover? To use CLR Oil & Grease Remover, sweep the area clean of heavy dirt and dust. For stains such as tar or heavy grease, scrape off as much as possible with a putty knife before cleaning. While wearing household rubber gloves test a small, hidden area of the surface first before cleaning the main area. Pour or brush full strength to an area no larger than 30cm x 30cm. Depending on size and difficulty of the stain, let the solution soak for one to five minutes. Clean the area with a clean brush or broom until the stain is loosened. Rinse at once with cool, clean water. Repeat the process if necessary. Do not use CLR Oil & Grease Remover with any other cleaners, bleaches or acids. If cleaning near grass or shrubs, rinse the grass and shrubs before and after cleaning. What will happen if I leave CLR Oil & Grease Remover on too long? 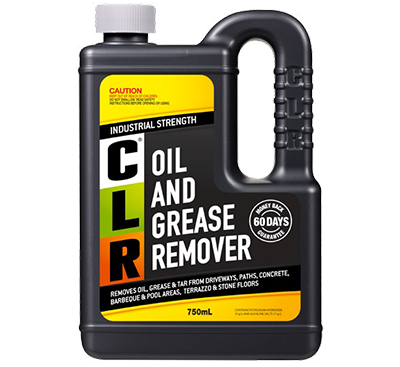 If CLR Oil & Grease Remover is left on too long and begins to dry, it can be very difficult to remove. What can I use CLR Oil & Grease Remover on? 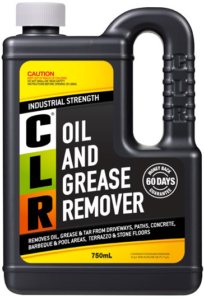 CLR Oil & Grease Remover can be used on concrete, terrazzo, granite, asphalt, stone floors and barbeque grills to remove oil, grease and tar. You can also use CLR Oil & Grease Remover for factory and garage floors, pool decks, sidewalks, ovens, motors, machinery and driveways. Surfaces with high oil/ wax content can be adversely affected.